Letterkenny from the Gaelic Irish “Leitir Ceannain” meaning “Hillside of the O’Cannons”. As a humble fishing village, on Lough Swilly and by the 17th century it had grown into a market town. Today it is the largest and most densely populated town in Donegal. Letterkenny really hits the mark for a wonderful holiday destination with many great restaurants, pubs, and clubs. 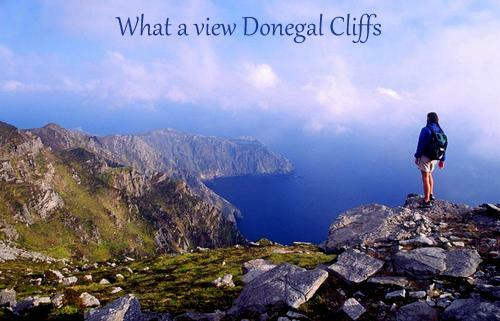 Donegal has always had a warm welcome, it makes every visit a joy. Some 16,500hectare park with mountains, lakes & glens, with a large herd of red deer and eagles, wonderful walking country. Guided tours of the Castle, audio-visual show, self guided nature trails, with beautiful gardens to explore. This is a must see! At 1972ft (597m) Slieve League(Grey Mountain)cliffs are the highest marine cliffs in Europe, dropping straight down to the wild Atlantic waves below. There is a fine walk with spectacular & impressive scenery right along the cliffs. Grianán of Aileach is a Ring Fort (circa.1000AD), built on the site of an ancient hill fort (circa.3000BC), said to have been built by Dagda, a King of the Tuatha De Danann, in 1700BC. Doagh Famine Village offers a large selection of life size attractions portraying life in Ireland from the 1840s until the present day. Built by the O'Donnell chieftain in the 15th century, beside the River Eske, The Castle is furnished throughout and includes Persian rugs and French tapestries. Information panels chronicle the history of the Castle owners from the O'Donnell chieftains to the Brooke family.